Miomia has adored Wini Burkeman’s gorgeous, all-natural skincare line since opening in 2005. McBride Beauty’s story is simple and beautiful. Using her mother’s maiden name and her flawless (yet highly sensitive) skin, Wini lovingly created an all-natural essential oil-based skincare line entirely made up of natural ingredients with no sulfites, no parabens, no synthetic color, no synthetic fragrance, and no animal testing (but of course)! Needless to say, we were thrilled to hear about McBride Beauty’s new look. 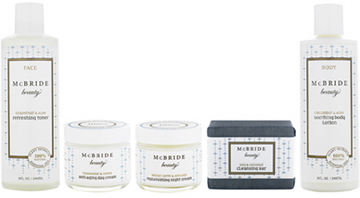 Click on the following products to read more about McBride Beauty, Brooklyn’s beloved beauty brand. You are currently browsing the miomia's musings : miomia apothecary blog | shopmiomia.com blog archives for November, 2007.